It’s always a pleasure to share with you items from Insight Editions. 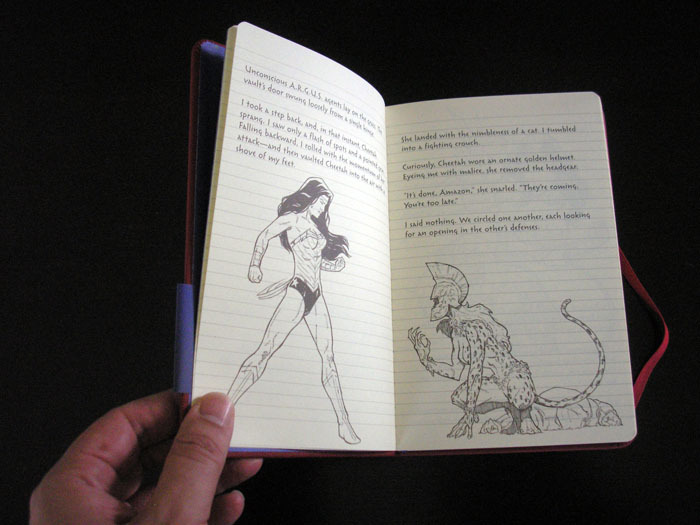 Here’s an inventive and useful item for superhero fans, the Wonder Woman Ruled Journal. Before it gives way to blank ruled pages, you get a few pages of Wonder Woman fighting Cheetah. In the midst of battle, she drops her journal with her strategic notes. The rest is yours to fill with your own adventure. 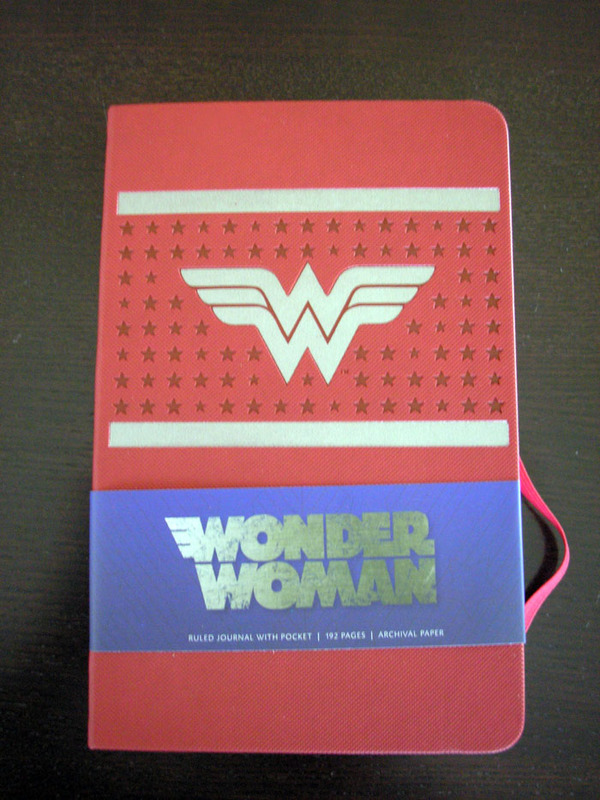 The cover displays the Wonder Woman logo in silver against a red background with star patterns. The rugged and rubbery texture is reminiscent of a superhero costume. It is 192 pages, measuring 5.25″ x 8.25″. Who wouldn’t enjoy this distinctive journal? This is perfect for anyone on your gift-giving list. And, by the way, there’s a Superman version too! Insight Editions is dedicated to creating the very best illustrated books focusing on photography, musics, and pop culture. They are one of my favorite publishers and I look forward to sharing more of their exemplary work with you. 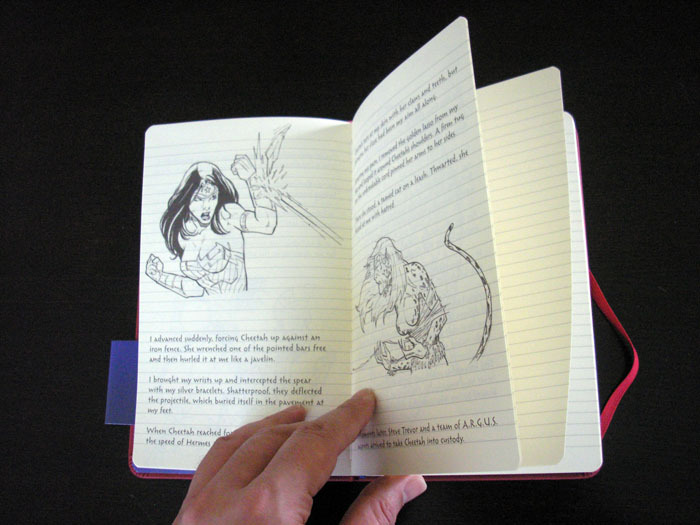 The Wonder Woman Hardcover Ruled Journal is available as of May 19, 2015. For more details, visit our friends at Insight Editions right here. You can also visit here, here, and here. That’s a really good find! 🙂 Looks good and I bet a lot of Wonder Woman fans will be putting this on their wishlists! Now, if only I could find an Edward Elric journal! 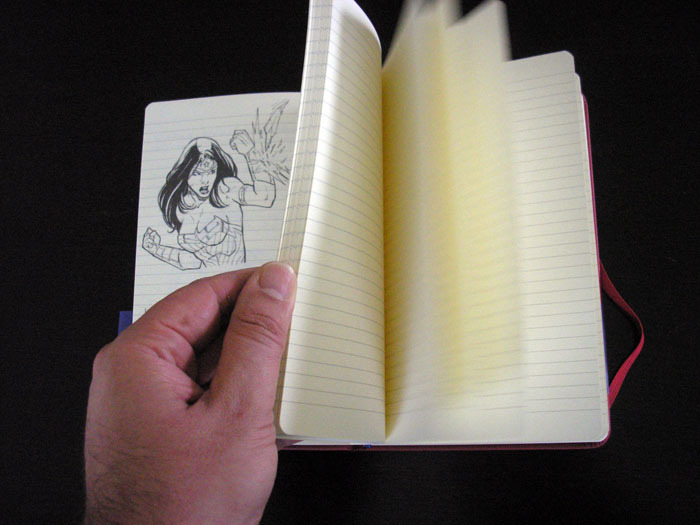 I think having Wonder Woman and Superman journals is brilliant as that cover quite a lot of preferences. But, yeah, manga journals totally make sense to me too. Maybe Insight Editions will bring some out in the future. How clever and creative. I can think of a good handful of people this would be perfect for. Thanks for sharing! Yes, great gift. Thank you for commenting! Oh, I would have loved to receive something like this! Great find!!! I already have stationery obsession/addiction and now you introduce me to stationery plus. What a fab notebook. I’m trying to resist. What an awesome gift idea for the comic lover. It would be cool to have one with a mix of characters one for each day with a quote. Thank you for sharing. I hope you are well. Warmest wishes. Yes, it’s a wonderful idea. Insight Editions have already moved beyond Supes and Wondy. I’ll post about that soon. Cool. A bit of spidey to accompany my jottings would’t go astray either. Hope all is well and that you have a great weekend! Warmest, wishes.